The Beantown Bloggery: Is that BU Jamba Juice Still Around? I haven't been to the BU area in quite some time. Is the Jamba Juice still there? I tried to use the store locator and it didn't turn up. Maybe I was doing something wrong. Anyway, if you go to the Jamba Juice website, there's a Buy One Get One Free coupon if you register on their site and submit your email address. I could definitely go for a smoothie right now. It's been pretty hot out these last few days - excellent summer weather. On a side note, I went for a ~3.3 mile run yesterday outside for the first time in probably a year (I've been doing strictly treadmill lately) to see if I could even attempt to train for the half marathon (here) - and the answer is probably not. I've been spoiled running on a treadmill in an air conditioned gym. Hitting the pavement in the summer heat is way more difficult. Click (here) to go to the site to get your coupon. 4 Response to "Is that BU Jamba Juice Still Around?" It's still there! At least it was in mid-May. I imagine it still is. Isn't it inside the Student Union? Probably wouldn't appear on searches if that's the one you're thinking of. Search for Boston, MA on the Jamba Juice site and the BU locaton shows up. 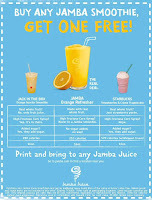 I see you and I both like jamba juice :) high five for coupons!